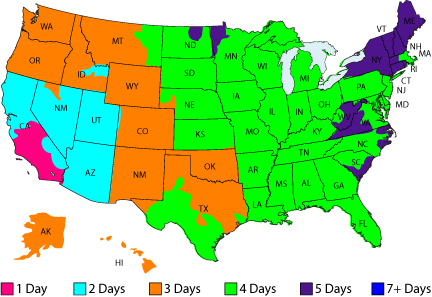 We ship out of multiple locations all over the continental USA, typically via Fedex or UPS Ground. You will also have the option to add expedited shipping services to your order during checkout if you wish. By default, we do NOT add insurance to your order but if that is something you would like us to include, please let us know in your order notes and/or during art approval and we'll gladly add it to your order. 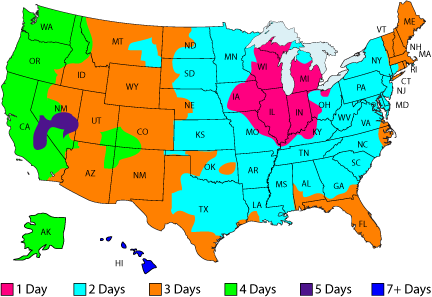 We try to match the closest printing facility to the customers delivery address for the quickest possible delivery date. 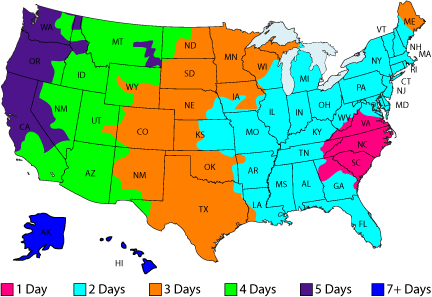 For example, if you would like your items delivered to the East Coast, we'll ship your order out of our East Coast facility with an estimated transit time shown in the below East Coast Ground Transit Time map. Please bear in mind though that the current production schedule at each facility will also play an important role in which location your order will ship from. Teemand - Wholesale custom t-shirts & apparel © 2019.